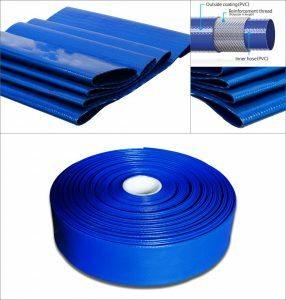 First, the PVC lay flat hoses connection, fire PVC lay flat hoses in the cover of PVC lay flat hoses interface, the cushion on a layer of soft protection, and then with galvanized wire or throat hoop tied tight. Second, the use of PVC lay flat hoses. When using fire-fighting PVC lay flat hoses, the high-pressure-resistant PVC lay flat hoses should be connected near the pump. After filling, the PVC lay flat hoses should be prevented from twisting or sudden bending, and the PVC lay flat hoses interface should be prevented from collision damage. Third. PVC lay flat hoses laying. When laying PVC lay flat hoses, avoid sharp objects and various kinds of oil, lay PVC lay flat hoses vertically to the height, use the PVC lay flat hoses hook, lay PVC lay flat hoses through the main road when laying PVC lay flat hoses, should be padded PVC lay flat hoses bridge, when passing through the railway, PVC lay flat hoses should pass under the track. Avoid PVC lay flat hoses broken down by wheels and intermittent water supply. Fourth, prevent icing. In severe winter, when water supply is suspended on the fire site, the pump should be operated slowly to prevent freezing of PVC lay flat hoses and maintain a small discharge. The previous article：How to eliminate troubleshooting for mist sprayer?